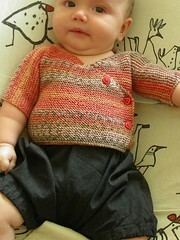 It has finally got cool enough to put baby Coco in her kimono top just before she grows out of it. The troosers made by Al’s fair hands match perfectly, but I’ve just had to take out the leg elastic as someone has rather larger legs than expected for her age. I made another of these but it was far too small for her even though she was premature.